Currency with shades of orange, yellow and red in background is latest effort to fight counterfeiting. NEW YORK (CNNMoney.com) - The new $10 bill starts to circulate Thursday, as the third more colorful bill designed to thwart counterfeiters is rolled out. The new bill has color-shifted ink that changes the color of the numeral "10" in the lower right-hand corner from copper to green as the bill is tilted, and has a subtle background in shades of orange, yellow and red. 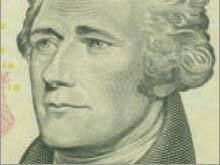 One of the most noticeable design changes is the portrait of Alexander Hamilton, the nation's first treasury secretary. While Hamilton's likeness is the same, it is no longer surrounded by an oval as on the old bill. As is always the case with new currency introductions, the old cash can still be used. But the U.S. Bureau of Engraving and Printing is rolling out the new currency in order to make counterfeiting more difficult. "The intention was not to create a counterfeit-proof note -- which is basically impossible -- but one that's harder to duplicate and easier to authenticate," said Eric Zahren, spokesman for the Secret Service, when the new design was unveiled in September. The Secret Service is in charge of combating counterfeiting. "The new designs have definitely improved upon our efforts in detection and enforcement," he said. "Ten years ago, one percent of (counterfeit) bills were produced on digital equipment. These days, 56 percent are produced on digital equipment, and the technology is more accessible to the general population." The new series began with the introduction of the $20 bill on October 9, 2003, and continued with the $50 bill issued on September 28, 2004. The government currently has no plans to redesign the $5, $2 or $1 bills. For more on the new $10 bill, click here.